The original show notice had also referenced a charity donation. At the time, an amount and recipient had not yet been determined. While I'm still in the process of settling on a charity for the gallery proceeds, I will be pledging a 10% donation on all sales to one of the following. Gallery for the upcoming show is now live. Majority of the works are presented in black-border, floating-glass frames of various sizes. Two of the pieces will be presented as an aluminum-dyed metal print set on a 1/2" floating mount frame. Please feel free to browse the selected works and inquire on discounted pre-purchase opportunities through the Contact link. Today marks the official launch of the IdleSessions.com site. It's still in the early stages of production, and an online gallery should be available within the week. Additionally, this also serves as announcement for an upcoming event on October 19th, 2012, sponsored by Art Revór. 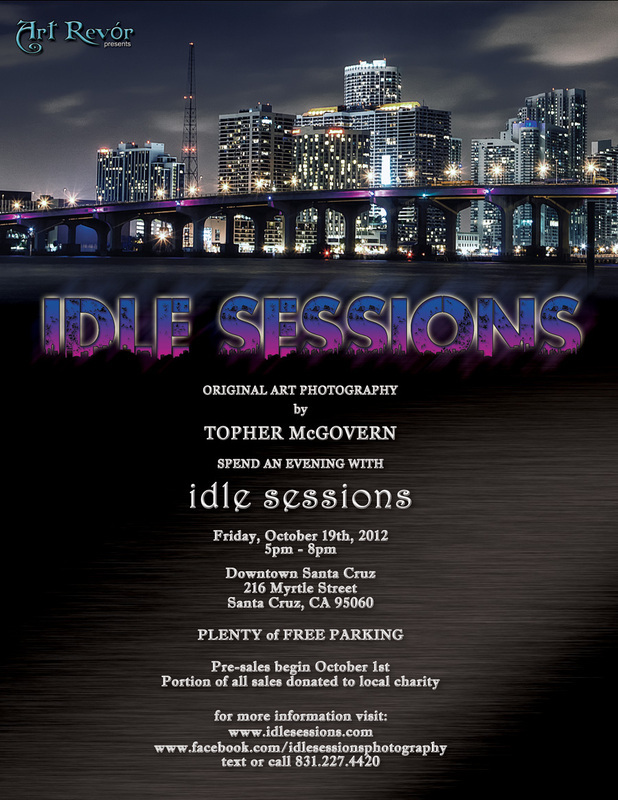 This show represents the first public display of the Idle Sessions gallery. The event is public and everyone is encouraged to attend. I look forward to seeing you there! Idle Sessions is a state of the art photon detention facility, specializing in long-term incarceration of light particles for public display.